Please refer to our stock # 090010 when inquiring. Circa 1950's. I believe these were made by Libbey Glass. I put white paper inside to show the coaches. It has 6. In excellent condition. 3 7/16" tall with heavy base. I have 8 available. Libbey Old Coach Heavy Base Juice Glass 4 oz. 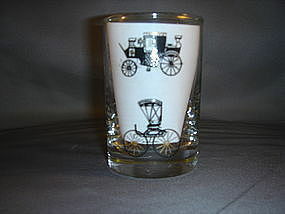 Libbey Old Coach Juice glass 5 oz Libbey Old Coach Tall Beverage Glass 15 oz.